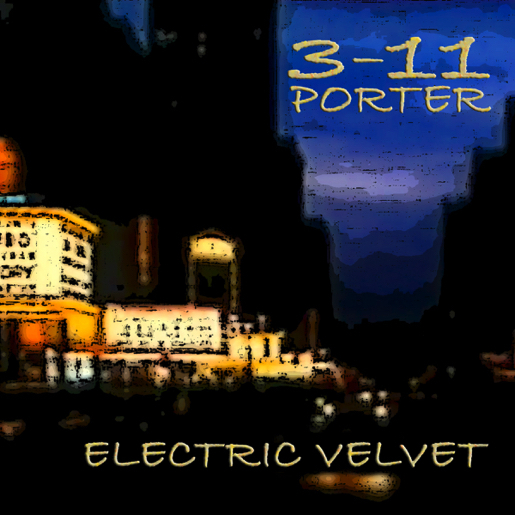 3-11 Porter has managed to create their very own universe, as well musically as lyrically. The lyrics of 3-11 Porter, is like short stories or short movies, and when you dive into the lyrics you never know what you'll find. Sometimes it is not hardly what you thought it was. "Electric Velvet" is the band's third studio album. "Marvellous" opens the show and talks about how to live with your mistakes and shortcomings. A lovely blue song with a Charles Mingus-like groove. “Electric Velvet” carries you into the title track, mystical, melodious and rolling. The song is played in a funky rhythm. "The Morning Gathering" is perhaps one of the most groovy songs on the album. The lyric tells a story about all the people you can meet late at night in a city. "Madame" is like taken from a French movie, dark and low. "Earth From Space”. An up tempo song with Brazilian rhythms. The lyric is inspired by a documentary about Joe Kittenger, who was the first man who jumped from a balloon in the space in 1960. "Silver Screen" starts down but builds up to a climax. It’s about the back side of, to be a known star in the movies and reality media. It is about how the media and the audience worship this kind of celebrities. "Ocean Blue", is moving into a slightly more jazzy waltz. The perfect night song with bass, strings, flutes, guitar and drums. "Waiting For You” floats away and set off, just as the time. Per Arne Bertheussen’s dark and unmistakable melancholic voice with one of Norway's best singer: Tracee Meyn. This is pure magic. A song with multiple layers, it is a song, perfect for quiet evenings by the fireplace and a good wine. With a message to contemplation, like most of 3-11 Porter's songs. "The Ugly Thing" is perhaps the most rocking song from the album. It's about not to promise something, that you know you cannot deliver. A song about betrayal and breach of trust, but also hope. "Belly Of The Beast" is a small happy tune, at least musically, a really clever pop song, with a sting and a story which is more relevant than ever. The beast that grows and grows from its own greed. Perhaps it is the case, that all great empires and leaders fall for their own greed. "Sweet Summer", a song about loss, is a perfect way to end the album.